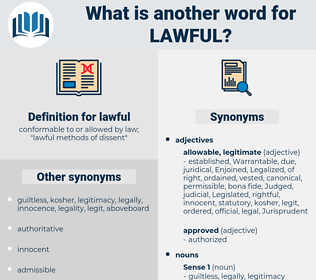 What is another word for lawful? conformable to or allowed by law; " lawful methods of dissent"
permissible, justifiable, law-abiding, illegitimate, illegal, justified, Legalized, valid, juridical, authorised, authorized, law-based, well-founded, fair, Allowed, regular, Legislated. illegitimate, incorrect, unacceptable, taboo, illicit, prohibited, wrong, illegal. evil, irregular, corrupt, guilty, reprobate, under-the-table, sinful, bad, under-the-counter, unjust, unconstitutional, unauthorized. Guilt has no place of sanctuary; wherever found, 'tis virtue's lawful game. I consider that the deer in this forest belong to King Charles, who is my lawful sovereign, and I own no authority but from him. 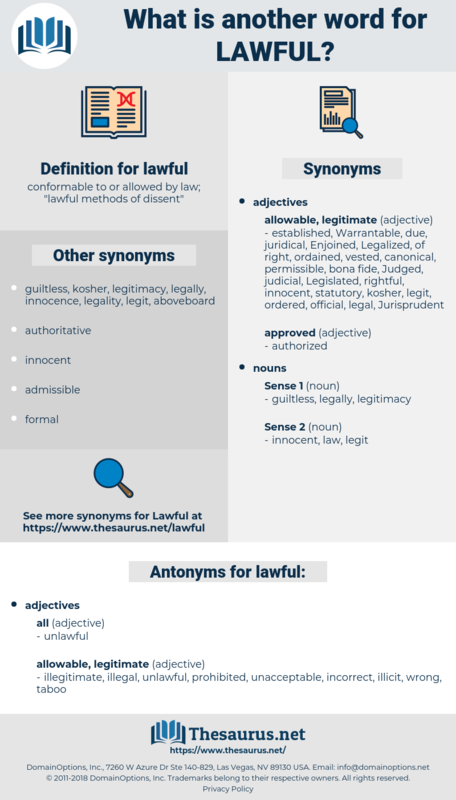 lapful, lively, liable, labile, lowball, lobule, low blow, lobelia, lapel, lovely, low-level, liveable, label, lovell, lawfully, labial, level, loveable, lappula, lovable, loblolly, libel, loophole, livable, love apple.